EDIT: Giveaway is officially over. Congratulations to Patrícia Dias for submitting the randomly chosen 191st entry. My hands are dry, my hair is staticy and it's not even officially winter yet! The above magic vial pendant by Izile's Oddities could combat the cold weather blues. The powerful ingredients include a good bit of genuine Emerald for life, health and the essential essence of our Earth; green Tourmaline for healing, strengthening and stimulating; and Peridot for regrowth, vitality and infusing fresh energy and life. The power-packing combo is blended together in a neutral oil base with leaves of Sage for longevity, wisdom and endurance. The "Vitality" vial is finished in Sterling Silver wire, sealed with a glued-in cork and hung on a brown cotton sliding cord. And if you win the $25 gift card Izile is giving away to one random reader, you could freely choose this pendant and carry the green of Earth with you until spring. 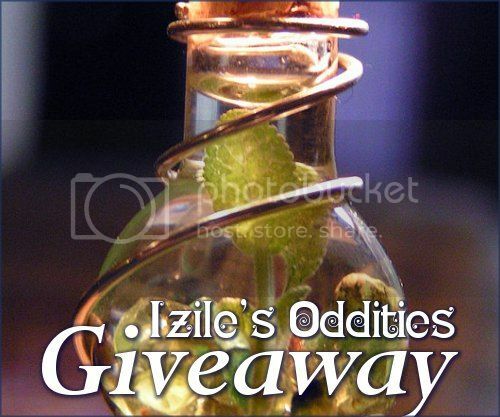 The magic vial pendants are Izile's signature item, but she is a maker of many odd fantasies and fantastic oddities. She started her Etsy shop as a creative outlet. She favored fantasy and nature genres, but didn't know what direction her creations would spin. Thus far her other divine dabblings include paintings, sculpture and gemstone jewelry. Use the Rafflecopter below to enter to win Izile's gift card giveaway before 11:59pm EST on November 30, 2012. Be sure to leave the mandatory comment on the blog post with the same name you use to fill out the Rafflecopter - all entries by winner must be easily verified or a new winner will be chosen. My favorite item is the Magic Vial- Lantern Pendant. Everything thing there is unique and cool! I love the Lantern Pendant and the Heart of Creativity Pendant the best, so gorgeous! I like the Magic Vial - Ancient Egypt Pendant. I love the Magic Vial - Gold Sun!! My fav's are the Swiss Blue Topaz and Sterling Silver Post Earrings! I like Swiss Blue Topaz and Sterling Silver Post Earrings...stunning.......ciao4now64 at yahoo dot com. Magic Vial - Lil Heart N Soul Pendant is my favorite, really awesome! I really like the Magic Vial - Spiritual Pendant! So pretty!! I really love the Magic Vial Heart of Love Pendant! It's is so beautiful! My favourite piece would have to be your "Magic Vial - Ancient Egypt Pendant"! It's simply stunning. But of course, all your pieces are, hun! I like the vitality pendant! Love the coming storm pendant. The vitality vial is soooo gorgeous. I love the Lil Mind pendant. http://www.etsy.com/listing/113672924/magic-vial-dreaming-pendant Love this so much! I love the Magic Vial - Heart of Creativity Pendant! I love the necklace...very unique & pretty. thanks for hosting, my fingers are crossed. I love http://www.etsy.com/listing/113669027/magic-vial-energy-pendant - I have CFS so this would be perfect! I like the magic vial deep thought pendant. I love the Magic Vial - Vitality Pendant - so brilliant!!!! my favorite is the blue topaz drop pendant, it's beautiful! I like the heart of love pendant. I love the Rosebud Garnet earrings! I love the Circles Silver Necklace,gorgeous!! My favorite item from Izile's Oddities is: http://www.etsy.com/listing/108976011/circles-silver-necklace. Love, love, love the Swirling Winds - Amethyst Sterling Silver Ring. I love the scarred heart ring! Hm...so hard to choose! But, I love the Swirling Winds ring the most! I adore the Gold Sun magic vial pendant. What a wonderful shop! I like the magic vial - dreaming pendant! I love so many things but this ring is amazing! I like the frozen tears dangle earrings. Simple I know, but they are my style. I love the Swiss Blue Topaz and Sterling Silver Post Earrings. These are so pretty! I love the Speak to Me opal and malachite ring, stunning! Love the Magic Vial - Lantern Pendant!!! My favorite is the Magic Vial - Deep Thought Pendant. Thanks for the giveaway! I love the Magic Vial - Ancient Egypt Pendant - with real ancient Egyptian beads from 1200 - 1500 B.C. Rosebud garnet earrings for SURE!!!! I like Swiss Blue Topaz and Sterling Silver Post Earrings. I really like the Magic Vial - Lil Heart N Soul Pendant. I like the Frozen Tears - Icy Topaz and Sterling Silver Dangle Earrings the best! the Magic Vial Lil Starry! I love the Magic Vial - Heart of Love Pendant! http://www.etsy.com/listing/108977457/rosebud-garnet-earrings These garnet earrings are my favourite by far!! I love Magic Vial - Heart of Love Pendant. I <3 the Rosebud earrings!!!!! I like the Circles Silver Necklace.